Leaders in Orthopedic / Sport / Geriatric Physical Therapy, your movement specialists help you reach your health and wellness goals and achieve the quality of life that you deserve. From neurological to foot problems, from pain management to improving sleep duration and quality, from work related injury to auto accidents, from young kids to athletes of all levels to young at heart (geriatric community) - hence AAA stands for Across All Ages - your rehabilitation therapists are here to provide the best personalized physical therapy possible and exhibit the values of Compassion, Dedication, and Excellence! Nina has 10+ years PT experience in home health, hospital, and outpatient PT settings. She is a Certified Exercise Expert for Aging Adults (CEEAA) and AIB Certified in Vestibular Rehabilitation. She is on her way to complete her Doctor of Physical Therapy (DPT) program. She graduated from University of Santo Tomas Manila, Philippines. Nina loves to travel with her family of four: 6 year old son (Miko), her husband (Roel Manuel), and their Chow-Chow (Mocha). She aspires to achieve the company mission to provide the best personalized physical therapy possible to her clients. What do I enjoy being at AAA Physical Therapy? Happy people coming together makes a great team! Awesome teamwork and collaboration of each member of AAA Physical Therapy staff promotes a healthy, nurturing environment that is what we need in achieving the best personalized physical therapy possible for all our clients. I love what I do and I love the people I work with. Joanne Colburn, M.P.T earned her Masters in Physical Therapy from Marquette University in 2000. In 2005 she completed the Certificate Program from The Manual Therapy Institute. Joanne has treated in a variety of settings that include Outpatient Adult and Pediatric Orthopedics, Sports Medicine and Occupational Medicine. As a Physical Therapist she feels strongly about using a hands-on approach in treating her patients. Joanne's treatment philosophy encompasses a combination of patient education, strong home exercise programs and utilizing manual therapy. This approach fosters functional ability, patient compliance and confidence in their overall medical treatment plan. In her free time, Joanne's enjoying her family with all their sports, music, & school events. She also hopes to impact local & national healthcare policies. I have been a physical therapist for ten years now with experiences in hospital and rehabilitation facility. I obtained my Bachelor of Science in Physical Therapy at the University of Santo Tomas and completed my Doctorate in Physical Therapy at Massachusetts General Hospital Institute of Health Professions back in 2014. With much hard work and grace from above, I was able to complete a Geriatric Training Certification program through Great Seminars founded by Carole Lewis and Geriatric Certified Specialist through the APTA. I am currently incorporating Movement System Impairments into my outpatient practice to help improve function among my patients. It is a great privilege for me to be part of this wonderful rehab team at AAA Physical Therapy where I can be the best I can be as a physical therapist for the betterment of my patients. I hope to be able to work with you in achieving your goals to enhance your mobility and function whether it be for work, leisure or sports! Looking forward to our PT appointment! Mia has over 11 years of experience since graduating with a degree in physical therapy from the University of the Philippines Manila. She has worked in community-based, outpatient, and skilled nursing settings. She has also worked as a college instructor for physical therapy, occupational therapy, and speech pathology students at the University of the Philippines Manila and the Emilio Aguinaldo College in Manila, Philippines. Mia loves to learn and she enjoys sharing her knowledge with others. She plans to start working on getting her doctor of physical therapy degree and certifications within the next few years. She is particularly interested in manual therapy and neurologic physical therapy. I really enjoy working with the AAA Physical Therapy family. I’m learning so much from the team and they all make work fun and easy! Olive graduated in the year 2013, and has been practicing physical therapy for 4 years. She has worked in various rehabilitation settings including outpatient clinics, hospital inpatients, home service physical therapy and skilled nursing facility. Olive has worked her way up as one of the most reliable Physical Therapists in the business. She has experienced working with different age populations — Across All Ages as what AAA stands for; from pediatrics, adults, elderly, athletes and veterans. Although, geriatric physical therapy seems to be of her best interest, she has always had comfort rehabilitating on various age groups. 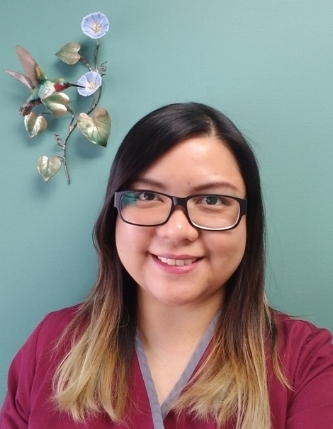 Pure with intelligence and compassion, Olive believes that Physical Therapists have a mind of a scientist, a heart of a humanist and hands of an artist. I enjoy being at AAA Physical Therapy because I get to work with people across all ages! In addition, my awesome teammates makes everyday fun!